Standard Horizon VP-66 Vacuum Fed Perforator - Roberts Business Machines, Inc. 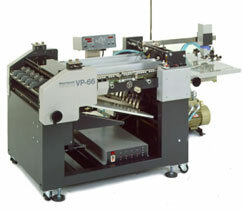 The Standard Horizon VP-66 vacuum fed perforator/slitter/scorer delivers unwavering precision and reliability. With speeds up to 15,000 sheets per hour, the VP-66 can handle 16 lb. carbon-less paper up to 11 point card stock. Eight interchangeable perforating, scoring and slitting blades are available, providing maximum flexibility for different applications.